Emperor, but it is as luxurious as it is inefficient. 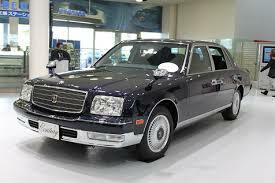 The Toyota Century is a 4-door luxury sedan created for the Japanese domestic market. In the past, the limousine was most commonly used to transport politicians and dignitaries in Japan. Indeed, the vehicle is certainly a luxury. The Century has a smoother engine than other luxury sedans in the same category as a result of its V-12 engine, the only one of its kind in the world, which makes the car function better than similar vehicles with V-8 engines. Further, this gives the car a sense of quiet because of the engine’s power. The exterior and interior design of the car also emulate luxury. The flat and boxed exterior design give the car a sense of power because of the association of this form car with the influential individuals it transports. As a result, the car itself seems to be powerful, no matter the passengers. The interior is also luxurious. Seats are made from high quality fabrics and there is more than enough legroom for passengers. Ornamental details, such as textured surfaces, curtains in the back seats, and rear massage seats, can be added, depending on the needs of the passenger. While famed dignitaries and leaders who only travel in the Century as a passenger may not notice its shortfalls, there are some things that are not necessarily great about the car. Fuel efficiency and fuel consumption are incredibly low in the Century, making it a very inefficient car to drive for any significant distance. Considering that the Century was created specifically for the purpose of chauffeuring the wealthy, the awful fuel efficiency makes sense, but for a driver who wishes to use the car as a genuine vehicle, the Century is not a comprehensive choice. Drivers will also face the problem of having a nose and back of the car that is uncharacteristically long, which makes parking and driving difficult at first. Because it is difficult to understand how far the car extends in either direction, it can be very hard to maneuver when first beginning to drive. The car, new or used, is either way expensive. Those who want to purchase it for daily use must consider whether the poor fuel efficiencies and investment to but it are worth the rewards the car bestows. Is driving in a luxury vehicle with connotations of wealth worth the money you must continuously put into the Century? If you are certain that the answer is yes, then the Century may well be for you.